With large gaps in scheduling and episodes aired out of order, making character development seem scattershot at best, it was no real surprise when NBC cancelled Freaks and Geeks, an hour-long dramedy from not-yet-household-name Judd Apatow and TV production newcomer Paul Feig (who would go on to rule comedy, with films like Bridesmaids, Spy and the upcoming Ghostbusters reboot.) The odds were against the series from the beginning, considering it's a period piece focused on normal-looking (if not sometimes abnormal) kids experiencing realistic struggles. But while it experienced a short-lived, little-watched life on television, its legacy is massive, in terms of the critical acclaim it's received, the devoted audience it earned and its place as the launching pad of a generation of some of the best and best-known performers and creators working today. The cold open of the pilot episode of Freaks and Geeks is the perfect introduction to the series. As the camera closes in on a high-school football player talking romantically with a cheerleader, a traditional high-school TV trope, suddenly the camera dips down below the bleachers they are sitting on to introduce the titular freaks, a group of ne'er-do-well rockers with no agenda to speak of. Then we meet the bullied geeks, threatened by older kids who get their kicks beating up their younger classmates. In the middle of these groups is Lindsay (Linda Cardellini), a lapsed mathlete putting her good-girl reputation on the side to hang with the bad kids for awhile. The internal struggle between her conscience and her curiosity, motivated by a crisis of faith never seen before on television, is the core of the show, but it's so much more than that. Though the series, set at McKinley High in Michigan at the start of the 1980s, focuses on Lindsay (and to a slightly-lesser extent her geeky little brother Sam [John Francis Daley]), over the course of the 18 episodes of this cancelled-far-too-soon series, audiences were able to get a full picture of an assortment of characters, all of whom were brought vividly and fully to life. Whether you find yourself siding with the put-upon geeks, living in a world that treats them as unwanted, or seeing a kindred spirit in the rebellious freaks, who refuse to conform to society's expectations but would like to fit in somewhere, you'll still relate to just about everyone in the main cast, mainly because they are all such rich characters. The geeks, led by nice-kid Sam, are true misfits, beset upon on all sides, facing pressure to leave childhood behind but struggling with the transition. Neal (Samm Levine) is the would-be class clown, filled with a confidence that's hardly deserved, while Bill (Martin Starr) is the epitome of geek, displaying an awkwardness that's never been matched in any medium. The freaks, headed by cool-guy Daniel (James Franco), are aimless, sexed-up pot smokers, but experience similar problems with expectations. His girlfriend Kim (Busy Philipps), is an unstable powderkeg, lashing out at anyone who gets in her way, Nick (Jason Segel) is the mellow stoner who dreams of drumming stardom, and Ken (Seth Rogen) is the cynical non-participant, observing and commenting on the world around him. As you'll no doubt notice from all those names, every one of them went on to either become a superstar (like Franco, Segal and Rogen) or a well-respected, frequently employed actor. Watching the show, it's easy to see why they had such success, as the performances across the board are outstanding, including Lindsay and Sam's parents, played by Becky Ann Baker and Joe Flaherty, a fantastic parental pairing. Even supporting characters are well-developed and memorable, like Stephen Lea Sheppard's scene-stealing role as the zen-like Harris, Tom Wilson's stereotype-defying Coach Fredricks, Dave "Gruber" Allen's wonderful hippie of a guidance counselor Mr. Rosso and Sarah Hagan's good-girl Millie. 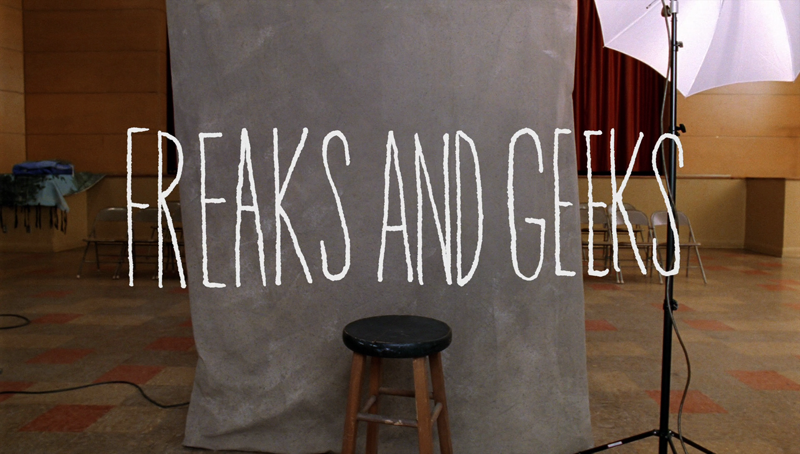 It's rare to see a show boast such performances deep into the lineup, but Freaks and Geeks has them in spades. Though everyone gets a moment in the sun, Starr may be the best of the bunch, imbuing Bill with incredible humanity and humor, often making an impact with just a look or his physicality. The thing that stands out most about the show, aside from the extensive and effective use of the era's popular music and the cinematic style, is how it never took the easy way out as it blended humor and emotion expertly. Situations rarely if ever wrap up neatly, the way they would on most television shows, as the heroes don't always win and the bad guys don't always get their just desserts. Sam's ongoing crush on dream girl Cindy (Natasha Melnick) is a perfect example of this, as he suffers through the pain of being nice to the girl he adores, only to see her interested in a guy who treats her like trash. However, it definitely doesn't end the way you might expect. Not being able to guess what's coming allows the show to continuously surprise, and it allows enhances the sense of reality. That makes the series' more dramatic or heartfelt moments hit that much harder, and has helped it have the impact it's had over time. Though there are many standout episodes (and not one episode could be considered even close to mediocre) there are a few worth highlighting. "Dead Dogs and Gym Teachers" is one of the more emotional episodes in the series, as we get to see a more human Kim, while Bill copes with how his school life and home life are colliding, while "The Little Things," in which Vice President George Bush is visiting McKinley, gives lesser-used freak Ken a chance to shine, as he questions himself after learning a secret about his new girlfriend, and also lets us see a different side of Mr. Rosso. And of course, there's the finale that shouldn't have been a finale, "Discos and Dragons" which pairs storylines about Lindsay and Daniel facing their futures and learning about who they are and could be. Even if it wasn't meant to be a series finale, it serves that purpose exceedingly well, putting a cap on the show's main themes of belonging, yet being yourself; and offering an open-ended finish that leaves the characters free to live their lives in the imagination of the fans. The early cancellation has its bright side, as Freaks and Geeks went out on top. The nine-disc Blu-ray Collector's Edition of Freaks and Geeks is a substantial package, with three keepcases (a double-width case with a dual-hubbed tray and different double-sided cover for each version of the series [more on that later] and one thin Blu-ray case for the bonus content) and a booklet, held in a sturdy, attractive slipcase. The discs have animated menus with options to play all the episodes, select shows, adjust the languages and check out the extras. Audio options include English 5.1 and 2.0 DTS-HD Master Audio tracks,, while subtitles are available in English. So, following Fox's release of The X-Files, which aired in 4:3 for its first few seasons, in 16:9, Shout! Factory decided to cover all the bases with the much-shorter run of Freaks and Geeks, and put out a set that offers the show in both its original broadcast aspect ratio and the 16:9 format it was shot in (with the exception of the first episode, which has been reformatted for widescreen displays on the 16:9 set, and presented open-matte on the OAR version.) After watching both, one wonders why anyone would want the 4:3 version, considering that the existence of that format was a result of technical limitations, not artistic choice, and the 16:9 version looks like it was always meant to be seen that way. Presented in 1080p, AVC-encoded transfers, the series, which was shot on film, has the look of independent film, with color that's appropriate, if not quite vibrant, and a healthy coat of grain that enhances the cinematic feel. The level of fine detail is quite high (which is most obvious in the textures of the outstanding costumes and the variety of hairstyles) but consistency is not a strength, an issue inherent in the source materials, as lighting and palettes can change even within a scene. Some minor banding and noise can be spotted in places, along with a minimal amount of damage (like a scratch here or there) but overall, it would be hard to ask for more of this series. The most impressive part of this release is the fact that, because the show was shot on film but post-production occurred on standard-definition video, Shout! Factory had the show rebuilt from scratch to match the original episodes, starting with new 4k scans of the original film masters. That means the series received an complete second wave of production, which replicated the work done on the originals. That's an incredible effort, and if any show deserved it, it's Freaks and Geeks. The results are terrific. Though some will listen to the original 2.0 tracks (probably the people watching the 4:3 version), the 5.1 DTS-HD Master Audio tracks are worth listening to while watching the new widescreen versions. They're mostly notable for enhancing the show's use of music, which gets a welcome boost in the surrounds, while atmospheric effects find a home in the sides and rear, with some nice placement in those channels. Dialogue is clean and crisp, and enjoys fine separation from the rest of the elements, and everything has sufficient power and clarity, though the low-end isn't a real part of the party and dynamic mixing isn't an ingredient, because it's just not that kind of series. For those who own one of the previous DVD sets, the only new extra here is the 45:59 "A Conversation with Paul Feig and Judd Apatow", which is moderated by L.A. Times critic Robert LLoyd. There may be only one new addition, but it's a good one, as the two hugely-successful creatives sit down to talk about their early interactions, the origins of Freaks and Geeks (including the identity of the show's potential first director), the cast, the use of improvisation (and the influence of Larry David), the show's alternate-universe HBO incarnation and its battle with cancellation. There's a lot of great detail and perspective on the show, including where it might have gone if it stayed on the air. There are 70 deleted scenes available to check out, running a massive 1:46:41, with optional commentary from Apatow, Starr and Daley, who chat about the moments, while Apatow offers the reasons the scenes were cut. Most of it wouldn't have added to the series, but there are a few gems, including an improvised scene between Starr and Allen that is pretty fantastic, as well as some singing and dancing. Though the trio is just watching and laughing at times, there's plenty of interesting/entertaining stuff here, like Apatow criticizing his directing style and talk of early Leboeuf. (Apatow at one point notes that Starr and Daley don't have much to say and compares the tracks to MST3K, before getting off-track and ruminating on the idea of commentaries.) They aren't all pure deleted scenes, with some bloopers mixed in, and though their inclusion is odd, they are certainly welcome as they are great moments. The bonus disc is where the rest of the extras are held, including that conversation with Feig and Apatow. There you'll find the "Paley Center Q and A" from 2000, featuring a full stage, with Baker, Flaherty, Allen, Rogen, Starr, Philipps, Levine, Segal, Daley, Cardellini, Jake Kasdan, Apatow and Feig in attendance (while Franco is notably absent, though never mentioned.) Recorded during the show's run, with the hopes of a second season still in the air, this 72:11 piece lacks in the perspective seen in the Feig/Apatow sit-down, but moderator Ron Simon, TV curator for the Paley Center, covers a lot of ground in terms of the show's development, including talk of auditions and the challenges of network TV, while the people on the show share a lot of laughs. A Q&A follows, which allows for plenty of adulation, an impromptu verse from "Lady L", a fantastic story from Feig, as well as some bonus creepy fan action. Three table readings are available to watch, for "Kim Kelly is My Friend" (49:33), "I'm With the Band" (47:16) and "Girlfriends and Boyfriends" (51:45). Aside from getting to see how these readings take place, you also get to hear lines that didn't make it into the final episode, as well as alternate reads. Some additional deleted scenes not found on the other discs are included (9:04), featuring a look at how Fredericks reacts to Bill and a makeout scene with Sam and Cindy. The handful of moments also can be viewed with optional commentary from Sam and Bill (in character.) Whether it's canon or not, they talk about some things that happened after the episodes, rather than what happening the scenes they're watching. Unplanned, it's kind of awkward unfortunately. Cast Auditions are always great, because they let you see how the cast got their jobs, and there's a load of these clips to check out, 59:06 in all. The auditions are divided into groups, like the freaks, geeks, McKinley students and authority figures (a group which oddly, though somewhat appropriately, includes Sheppard), but the best part is seeing actors reading for parts they didn't get, like Cardellini and Philipps reading for each other's roles, Rogen auditioning for a part that seems to have become Bill and Flaherty as Coach Fredricks. Unfortunately, in what seems to be a trend, there's no Franco here either. "Long Live Rock" (7:41) delivers a trio of uncut musical performances, with Millie and Nick rocking out at the piano on "Jesus is Just Alright", while Mr. Rosso performs "I'm 18" both acoustically and with his band Feedback. That they are all highly enjoyable speaks more to the quality of the songs than anything else, but the earnest performances by Hagan and Allen help as well. For fans of Harris (who isn't? ), "Sober Students Improv Players" (5:04) allows you to watch an uncut take of the PSA-like presentation, complete with suggestions, both heard and misheard, from off-screen. The improv just heightens the ridiculousness. There's even more uncut footage in "Tales of the Secret Services" (7:19), as Ben Stiller riffs to Mr. Rosso, and drops a George W. Bush joke that's not really funny anymore in retrospect. "Behind the Scenes" is 18:32 of home-video footage from the set, which mainly serves to show Daley acting like a goofy kid, whether he's bothering his TV sister, speed eating or making faces. We also get a peek at Levine in a locker, the show's prom-styled wrap party and the last day of production, with short speeches from Feig, Apatow, Kasdan and Cardellini. Heading to the Smorgasbord section, we start off with "Raw Footage" (27:01), a reel of 4:3 unedited clips from across the series' run, including coverage of group scenes and complete takes (with flubs, off-screen coughs and director's comments.) "Odds and Sods" (26:03) is more of a quick-hit version of the previous extra, with a variety of unused moments, like Chauncey Leopardi (Alan the bully) laughing his way through reading prank phone calls to Fredericks, Nick and Daniel discussing David Bowie's sexuality and Daley struggling to angrily eat a banana. "NBC Promos" is just that, with 27:58 of clips used to sell the show. Among the clips are original scenes that didn't appear in the show, which feature a logo design that wasn't used in the show and some of the dialogue has been removed (likely due to music rights issues), thoughtful and/or informative interviews with Cardellini, Daley, Levine, Franco, Philipps, Segal, Starr, Rogen, Flaherty, Baker, McGuire and prop master Chuck McSorley; along with some promotional clips and behind-the-scenes footage. A 5:28 blooper reel is sadly not as funny as you might expect, but it has its moments, usually involving Levine or Starr. It's followed by "Seven Minutes in Heaven" (1:51), a faux music video for the song "I'm Going to Kiss You All Over", made up entire of shots from Bill and Vicki's scene from "Smooching and Mooching." What the purpose of this, other than being made purely for Starr's eternal bragging rights, is quite unclear. "Graduation" (2:33) includes home-video footage of a wrap party graduation ceremony for Rogen, Starr and Levine, emceed by Feig, with speeches from two of the three. Some content would have been nice, but it wasn't meant to be. "Extra Goodies" (14:46) is another weird mix of clips, including an extensive crying jag, go-kart acting, a performance of "Lady L" featuring Segal, Apatow and Rogen, some fight rehearsal footage and even a karaoke video of "Lady L" for you to enjoy on your own. The on-disc extras wrap up with "Thanks, Goodbye" (2:50), a musical summation of the series' characters, set to Styx' "Come Sail Away." Though certainly worth a look (and a listen thanks to the great song choice), it doesn't feel long enough or sentimental enough to properly honor the show. For those of you who didn't shell out the cash for the deluxe yearbook version of the series, with its impressive hardcover, textured and embossed cover, the content (along with an unproduced script that was on the DVDs) is available online through a link on the bonus disc (and likely all over the internet eventually.) There's also a 40-page booklet in the set, which reproduces some of the Yearbook content, including a slightly cut-down version of the episode guide, as well as an introduction to the set. Freaks and Geeks remains a true television classic, an incredible representation of the highs and lows of adolescence, featuring tremendously memorable characters that are portrayed and crafted by one of most talented teams ever assembled for one series. That it only reached 18 episodes meant it never had a chance to disappoint. The same goes for this set, which puts an onus on being as complete a presentation as possible, from the two different aspect ratios to the seemingly endless array of bonus content. It may be hyperbole, but with this set, Freaks and Geeks has a real chance to have a The Catcher in the Rye-type of legacy among generations of teens, and an enduring sense of nostalgia for those looking back at their youth. It couldn't be more highly recommended.